With the Dakota Access Pipeline (DAPL) just days away from arriving at the Missouri River near Standing Rock, now is the time to increase public pressure on the U.S. Army Corps of Engineers. DAPL needs the Corps to issue an easement and a permit to bore under the Missouri River. Instead, the Corps should require more detailed environmental and cultural reviews of DAPL — which it should have done earlier. In yesterday’s blog, we wrote about the importance of delaying DAPL construction to drive up costs. Today, we outline several key arguments for why more review is needed. Email: http://www.usace.army.mil/Contact.aspx (This a “Fill in the Form” site. For “Recipient,” select “Executive Office” on the drop-down menu. Here are relevant arguments and articles. In Dakota/Lakota we say “mni Wiconi.” Water is life. As one example of recent pipeline problems, recall the Yellowstone River has suffered contamination from two spills in a four-year period. According to a 2015 PBS story, a ruptured oil pipeline leaked up to 40,000 gallons of crude into the Yellowstone River on Jan. 17, 2015, contaminating Glendive’s drinking water. In 2011, the Exxon Silvertip Pipeline spilled 63,000 gallons into the Yellowstone River. Ask the Corps to explain why DAPL will be a safe pipeline when so many others have leaked. The decision to route the pipeline near Standing Rock is environmental racism. According an article in the Bismarck Tribune. An early proposal for the Dakota Access Pipeline called for the project to cross the Missouri River north of Bismarck, but one reason that route was rejected was its potential threat to Bismarck’s water supply, documents show. That is a technical answer to a human question. What were the behind-the-scenes discussions on this decision? Did Bismarck leaders and residents concerned about their water supply exert pressure? Media reports certainly indicate Bismarck residents were concerned. The decision to move the problem to Standing Rock has loud echos of past racist decisions against Native communities. Tell the Corps that the issue of environmental racism needs to be addressed much more clearly than it has to date. 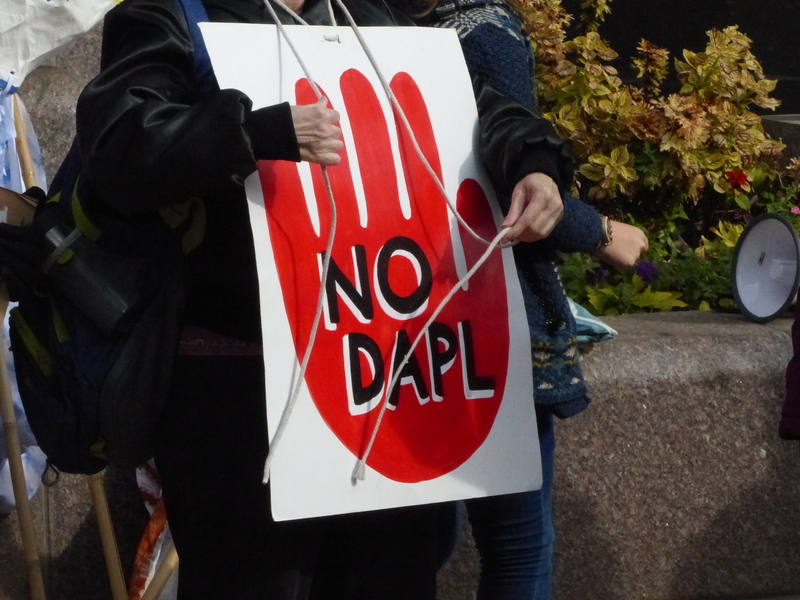 A more detailed Environmental Impact Statement is needed on the Dakota Access Pipeline. Senior officials at the U.S. Environmental Protection Agency and two other federal agencies [the Department of the Interior and the Advisory Council on Historic Preservation] raised serious environmental and safety objections to the North Dakota section of the controversial Dakota Access oil pipeline, the same objections being voiced in a large protest by the Standing Rock Sioux tribe that has so far succeeded in halting construction. Tell the Corps it should not simply rely on environmental assessments prepared by the self-interested pipeline company. It needs a full Environmental Impact Statement. Energy Transfer Partners intentional destruction of traditional cultural properties should bar the Army Corps of Engineers from issuing additional permits for the project. A clause in Section 110 of the National Historic Preservation Act states that if a company is caught intentionally destroying archaeological or cultural sites in the path of the project, the US government cannot legally give them any more permits. This is exactly what DAPL did on September 3. On Friday, September 2, the day before Labor Day weekend, Standing Rock submitted to the court detailed findings of rare cultural sites, which include 27 graves, stone prayer rings, and other sacred artifacts directly in the path of the proposed pipeline. Early the next morning, a Saturday, DAPL brought in construction crews and bulldozed the specific areas described by Standing Rock in their filing. When protectors of the site entered the construction area, private security guards attacked them with dogs and pepper spray. Here is a two-page summary of the 30-page letter to the Army Corps. The Society for American Archeology also has written the Army Corps of Engineers saying it needs to conduct a more detailed impact study. Its letter is fairly technical, but the gist is that DAPL has unresolved questions under the requirements of the National Historic Preservation Act. Tell the Corps that the pipeline’s impact on traditional cultural properties needs more study — and it should deny Energy Transfer Partners its permits based on this intentional act of destruction.